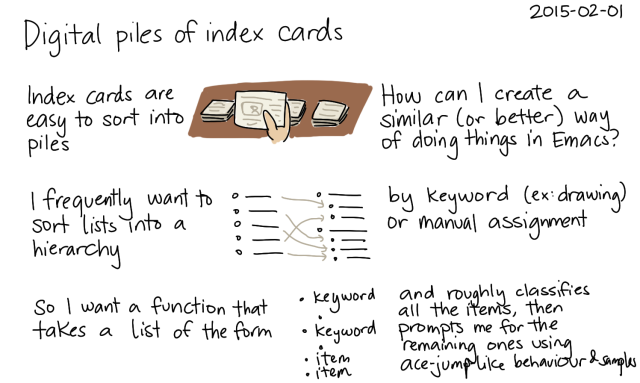 Somewhat daunted by the prospect of categorizing more than a hundred sketches and blog posts for my monthly review, I spent some time figuring out how to create the digital equivalent of sorting index cards into various piles. In fact, wouldn’t it be super-cool if the items could automatically guess which category they should probably go in, prompting me only if it wasn’t clear? It should file Link 1 and 3 under Keyword A, Link 2 under Keyword B, and prompt me for the category for Link 4. At that prompt, I should be able to select Keyword A or Keyword B, or specify a new category. Inspired by John Kitchin’s recent post on defining a Helm source, I wanted to get it to work with Helm. First step: I needed to figure out the structure of the list, maybe including a sample from the category to make it clearer what’s included. org-list.el seemed to have useful functions for this. org-list-struct gave me the structure of the current list. Let’s say that a category is anything whose text does not match org-bracket-link-regexp. "Return a list of (category indent matching-regexp sample). List categories are items that don't contain links." The next step was to write a function that guessed the list category based on the item text, and moved the item there. "Return a list of categories from this list in a form ready for Helm." After that, I wrote a function that used Helm to prompt me for a category in case it couldn’t guess the category. It took me a while to figure out that I needed to use :init instead of :candidates because I wanted to read information from the buffer before Helm kicked in. "Non-link categories in the current list"
The :action above refers to this function, which creates a category if it doesn’t exist yet. I’m new to fiddling with Helm, so this implementation is not the best it could be. But it’s nifty and it works the way I want it to, hooray! 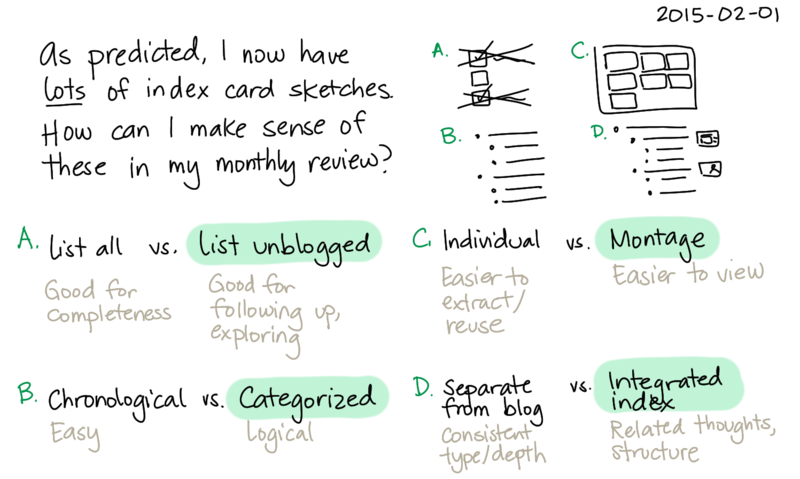 Now I can generate a list of blog posts and unblogged sketches, categorize them quickly, and then tweak the categorizations afterwards. You can see the results in my January 2015 review, or check my config to see if the code has changed. My next step for learning more about Helm sources is probably to write a Helm command that creates a montage of selected images. John Kitchin has a post about handling multiple selection in Helm, so I just need to combine that with my code for using Imagemagick to create a montage of images. Whee! Copyright © 2001-2018 Sacha Chua ([email protected].com). Please feel free to reuse or share content under a Creative Commons Attribution license unless otherwise noted. You can generally click on images for larger versions. Thanks for reading!